Hinduism, Christianity, Islam, and many other religions are a key part of life on Earth. It guides the daily living of almost 3 billion people and is the central focus for life’s great milestones; deaths, births, and marriages. Whatever your personal view, it is accepted that most religions do create a fraternity of mankind that no other organization has been able to do. Millions face Mecca each day to pray, many more say their daily prays, and all around the world the ritual of daily life revolves around the simple prays and words from ancient texts. 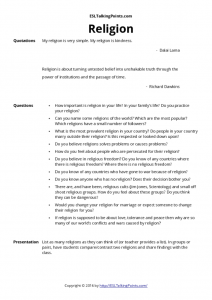 This conversation question sheet is to help stimulate a discussion with your students on what it means to them to be religious, and how their lives are influenced by it. The official faith in North Korea is Juche. There are roughly 1.5 billion followers of Islam. 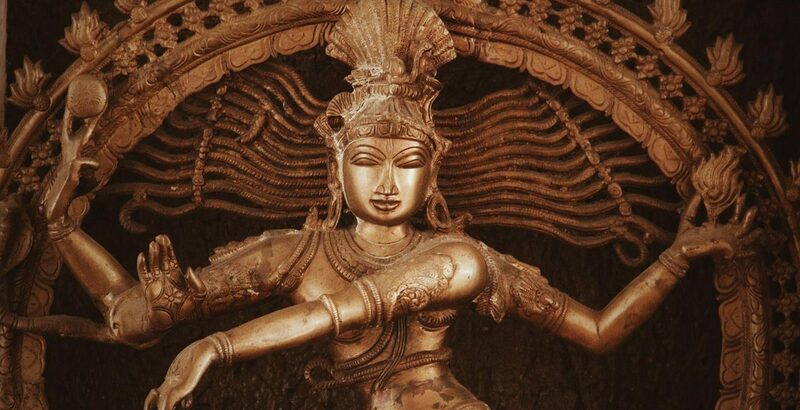 Hinduism is the world’s oldest faith. • How important is religion in your life? In your family’s life? Do you practice your religion? 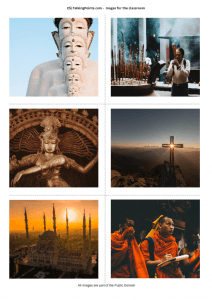 • Can you name some religions of the world? Which are the most popular? Which religions have a small number of followers? • What is the most prevalent religion in your country? Do people in your country marry outside their religion? Is this respected or looked down upon? • Do you believe religions solves problems or causes problems? • How do you feel about people who are persecuted for their religion? • Do you believe in religious freedom? Do you know of any countries where there is religious freedom? Where there is no religious freedom? • Do you know of any countries who have gone to war because of religion? • Do you know anyone who has no religion? Does their decision bother you? • There are, and have been, religious cults (Jim Jones, Scientology) and small of shoot religious groups. How do you feel about these groups? Do you think they can be dangerous? • Would you change your religion for marriage or expect someone to change their religion for you? • If religion is supposed to be about love, tolerance, and peace then why are so many of our world’s conflicts and wars caused by religion?